“What do you think?” Rob Fohr, director of Faith-Based Investing & Corporate Engagement for the Presbyterian Church (U.S.A.), asked after surveying the multi-room warehouse packed with household supplies. The leaders of two of the Presbyterian Church (U.S.A.)’s Compassion, Peace & Justice ministries stood among a rippling lake of bedding on one side and a sea of chairs and other furniture in various states of repair on the other. 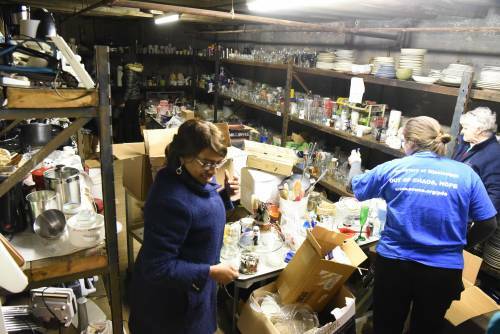 Added to the mix were dishes, cutlery, toys, medical supplies and many other items intended to help refugee families resettling in Louisville. Horton and Fohr were part of a nearly 40-person CPJ crew that took time out of staff meetings during a recent week to help Kentucky Refugee Ministries sort donations so they could quickly be distributed to refugee families when they arrived in Louisville, often with just a few days’ or hours’ notice. Giving the staff instructions, KRM donation coordinator Daynier Adan said he needed items sorted so that when he gets notice that, say, a family of five with two parents and three children, including a baby, are on the way, he can grab the necessary number of sheets, dishes, furniture and the like to quickly set up a new home for their arrival. “We felt it is really important to be part of this community,” CPJ Director Sara Lisherness said. “The staff at CPJ take their calling very seriously. While a number of PC(USA) entities deal with immigration issues, Lisherness said work with KRM is one way Presbyterians can care for refugees once they are in the United States. Adan knows that very well. Fifteen years ago he and his family arrived in Louisville to start a new life after fleeing Fidel Castro’s regime in Cuba. Although the flow of refugees has decreased in the past couple of years as the Trump administration has imposed new limits on immigration, Adan said the needs remain. The Louisville community has responded with donations and groups of volunteers like the CPJ staff. Heavenly Father, your unconditional love inspires us to be loving, welcoming and hospitable to our neighbors. Pour into our hearts your compassion and strengthen and guide us as we go forth to make your kingdom tangible. Grant us your peace and surround us with your presence. Amen.